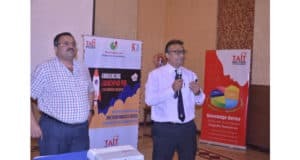 The Trade Association of Information Technology (TAIT), organised an interactive knowledge series session on Friday, 11th May 2018, at the Avion Hotel, Vile Parle. The event was a perfect mix of knowledge sharing on Business processes, Spiritual understanding of Success in the business world, and a member presentation of innovative products, as part of the debut Launchpad Pro presentation. The event started with a detailed Q&A session on the GST E-Way Bill by the Deputy Commissioner for GST, Gajanan Khanare. The session saw enthusiastic participation by members who asked series of questions to clarify their doubts about the soon to be implemented E-Way bill. The E-Way bill set to be implemented from the 25th May 2018 requires traders to mention the invoice value and details of vehicle etc. for goods being transported across the country. The session on GST was followed by a deeply motivational and insightful session on the meaning of Success in both personal and professional lives, by Swami Chaitanya Lila Das of the ISKCON movement. An IIT Kharagpur alumni himself, Swamiji spoke in the language of the audience as he made his point through anecdotes and jokes on everyday life. The session was very well received by the members who also asked several questions after the talk. Amidst an attentive audience still in a thoughtful zone after a contemplative session on life and success, Rushab Shah of Graham Information Systems Pvt. Ltd., took centre stage as the member participant for the 1st Launchpad Pro event. Launchpad Pro, the latest TAIT initiative, enables members to showcase their range of product and services to the rest of the member partners, through the TAIT platform. As part of Launchpad Pro session, Shah spoke at length about his innovative, in-house brand, ZEUS – a range of innovative and smart entertainment and communication products. The line included Bluetooth speakers, a portable karaoke and entertainment set box, power banks and laser pens etc.. With attractive pricing, sleek design and dealer benefits, the presentation generated a positive excitement and enthusiasm among the audience, with many of them trying it out after the session. The evening ended on a musical note with the innovative entertainment box by ZEUS played melodies from the 80’s and 90’s, while members enjoyed light-hearted conversations with friends over dinner. It was indeed a gathering that offered a lot for everyone to take back with them. TAIT organises its first Knowledge Series for the financial year 0 out of 5 based on 0 ratings. 0 user reviews.